Hi guys! I've been playing with my new Bundle Monster plates some more so I am excited to show you a couple of manicures with them in the coming weeks. I hope you will like them! Curious what I've got for you today? 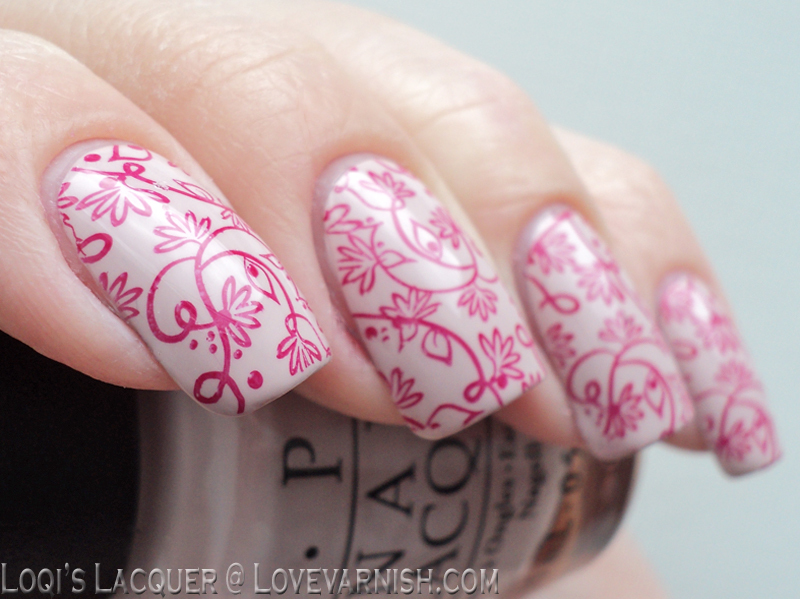 Today's manicure is a girly pink and flowery one! The base polish for this manicure is the lovely OPI Don't bossa nova me around. This is such a lovely polish. It applies so evenly and smooth, I love it. For the stamping I used P2 Flashy (a one-coater, so it's also useful for stamping!) and Bm plate 711. I had actually done this manicure before a while ago. But I had just broken a nail :( so I didn't take any pictures. I loved the manicure so much however that I wanted to do it again so show you guys! I hope you like it and see you next week! This is beautiful! 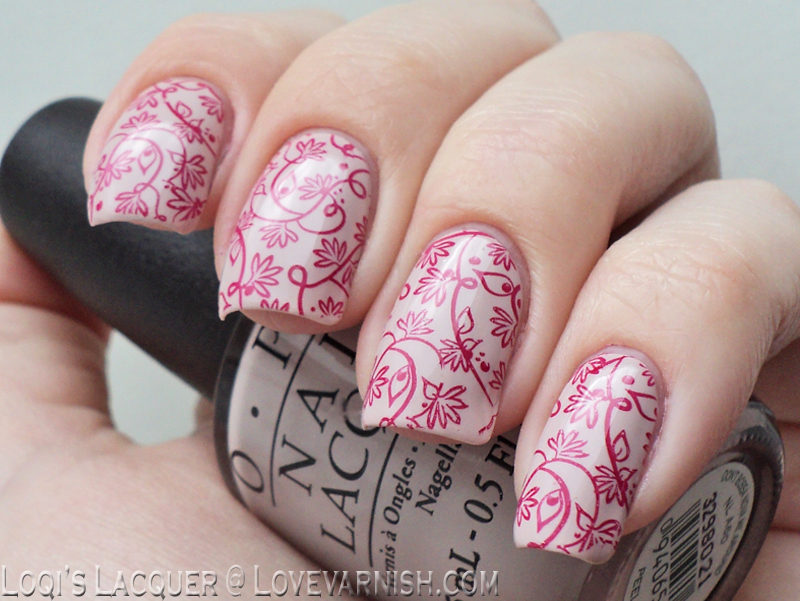 I love that you used a toned down base to really make those flowers pop! That color combo is lovely, I like how fine the lines are with this design! These are lovely! The colors re beautiful together and I love that stamp! Your stamping is so clear! Lovely, lovely nail look altogether. Ugh - I really need Don't Bossa Nova Me Around in my life! It's so pretty! These are so pretty Manon! I'm so glad I got OPI Don't Bossa Nova Me Around (Deborah's fault of course). It's the perfect base! I love the colours you used here, such a pretty and delicate combo. I'm jealous of how crisp your lines are! 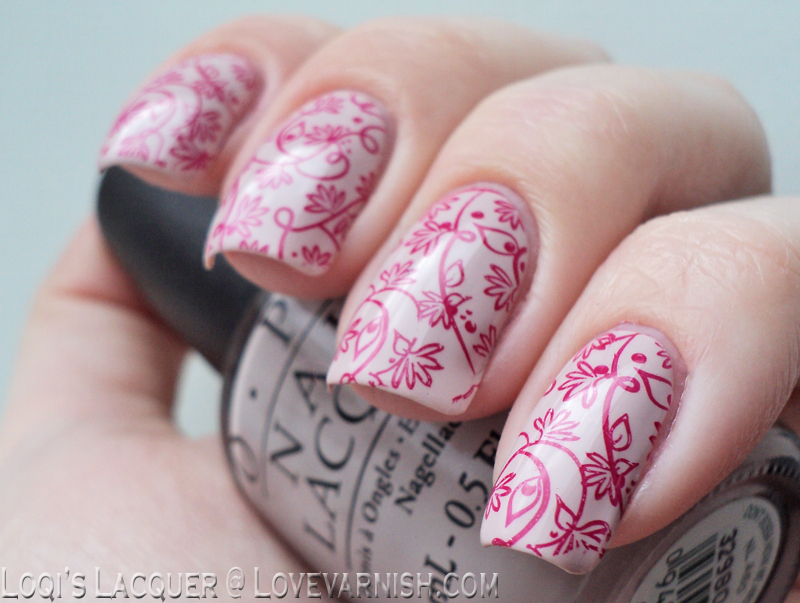 Such elegant and beautiful mani. Love the colors. This is such a beautiful combo! Don't Bossa Nova Me Around is just the perfect polish to use for anything and everything. It looks lovely with this stamp!